What is Voodoo? The first thing people think of when they hear the word is people poking pins into fabric and wax dolls in order to curse others. However, “voodoo dolls” aren’t actually a huge part of Voodoo – their use occurred more in European magic. Voodoo (also known as Vodou) is actually a religion, originating in the west African religion of Vodun, and brought over to the Americas by slaves. It is estimated that there are over 50 million Voodoo practitioners around the world. When the slaves were brought to the Americas, they combined elements of their West African beliefs with Roman Catholicism. As they were forbidden to practice their own religions, they combined their beliefs with Catholic-seeming rituals which allowed them to worship their deities, often in the guise of Christian saints. The main branches of Voodoo come from Haiti and New Orleans, although smaller branches are found in places such as Brazil, Cuba and the Dominican Republic. Unfortunately, Voodoo has been demonised through the years, and is associated with hexes, human sacrifice, cannibalism and other atrocities. A large part of this is to do with colonisation and slavery – these practices were done for economic gains, but one of the official excuses for enslaving people was to save their souls by converting them to the Christian church. To gain people’s support for slavery, native African religions were portrayed as evil and demonic. Unfortunately, much early literature published about Voodoo has informed the Western world’s opinion of it as a dangerous religion. The truth of the matter is, Voodoo is a spirituality, and magic is only a part of it. Most people practice Voodoo in order to connect with their deities and ancestors, and to develop spiritually. Of course, there are people who use Voodoo practices for more nefarious purposes, but generally, it is a religion which is focused on being good and charitable. In fact, Pope John Paul II praised followers of the religion for their “fundamental goodness”. As mentioned before, voodoo dolls aren’t a big part of the Voodoo religion, although some Voodoists do use them. Voodoo dolls are made to represent a specific person – often something belonging to the person is used in making it, such as a lock of their hair. Voodoo dolls are neutral in and of themselves, and are most often used to heal people. Other times, Voodooists use the dolls to represent one of their Lwa, similarly to how Wiccans place statues of deities on their altars. What Do Followers of Voodoo Believe? Voodoo is a monotheistic religion – meaning they only believe in one god. Their god is known as Bondye, which means “the good God”. However, although Bondye is the creator god, he is not directly involved with the everyday lives of humans. The beings that Voodoo practitioners interact with and petition are called the Lwa. The Lwa are intermediaries between Bondye and humans, and each one concerns itself with a different aspect of human life. For example, there is Ogun the warrior, Legba who holds the key to the spiritual world, and Erzulie who is the spirit of love and beauty. Voodooists develop relationships with Lwas that they feel kinship with or seek to learn from. Sometimes, the Lwa are invited to possess the bodies of Voodooists during ritual, so that the community can interact directly with them. Ancestor veneration is also a big part of Voodoo. It is believed that there is a visible and an invisible world, and when people die, they have merely transitioned to the invisible world, but are very much with us still. Voodoists often keep ancestor altars with images or mementos of their loved ones, and give offerings to their ancestors in order to appease them and keep them strong, In turn, the ancestors bring them luck and protection. Voodoo has ordained priests (houngan) and priestesses (mambo). They offer guidance and hold ceremonies, and there is a strong emphasis on the values of community in Voodoo practice. Voodooists believe that when we die, our body decays while our n’âme is absorbed back into the earth as energy. The gros-bon-ange return to the high regions where it came from, while our ti-bon-ange enters the land of the dead. Death rituals are important in order to make sure that each part of the soul goes to the place where it belongs, as lost souls are thought to bring bad luck to people in the land of the living. The word Voodoo originates from vo (introspection) and du ( the unknown). So the magic of Voodoo lays in the fact that it explores the unknown world, and it lays an emphasis on personal practice and experience. Voodoo can be used for protection, healing, and much more. Voodoo rituals commonly include singing, dancing, drumming and circle rituals. Ancestor veneration is also an important part of the practice, and it is thought that ancestor veneration is one of the best forms of “luck magic” that there is. The energies of the Universe are invoked during ceremonies, especially that of the sun and the moon. The Lwa are also invoked during ritual, and often Papa Legba is petitioned in order to help the Voodoist communicate with the spirit world, as he is the Lwa of the thresholds. A common type of magic used in Voodoo communities is simulacra magic. A simulacra is an object that is used to represent somebody or something else. The voodoo doll is a simulacra, but photographs, figurines, cards, and other objects can also be used. By taking this object and making a psychic link between it and the thing it is supposed to represent, a person can work their magic directly on the object, and it is thought that whatever happens to the object, happens to the actual person or thing. 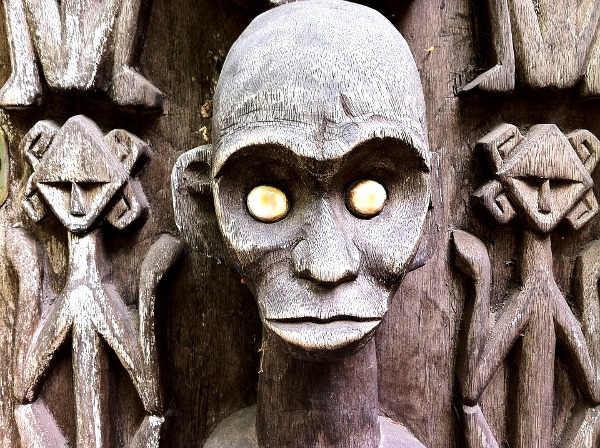 As we can see, Voodoo is actually a beautiful ancient religion which has an elaborate and fascinating history, and we hope that we’ve been able to dispel some common false myths about it!